Welcome to A Guest Hus Motel and Historic Knotty Pine Cabins — Your Home Away From Home in beautiful Lanesboro, Minnesota! We offer a friendly five-room motel in a 1900 house, plus two charming vintage cabins, all with private baths and air conditioning. What is a Hus? Hus is the Norwegian word for house, and we are so-named because of the strong Norwegian heritage of Lanesboro! Homey: Explore the gardens, glide on the glider, or relax on the patio to the sound of the gurgling fountain. An old-fashioned brick barbeque grill is available for guests, as well as picnic supplies and tiki torches. Or, rent the whole Hus for a family reunion or wedding, and have the run of the place! Affordable: Excellent mattresses, high quality cotton sheets, fluffy towels, good coffee with real half and half in ceramic mugs. We try to celebrate life’s little luxuries, reasonably. Rooms and cabins start at $79/night. Impeccably Clean: We’ve received a 100 percent score from the Minnesota Department of Health every year since we opened in 1992! Both smoke-free and pet-friendly, we offer locked bike storage, off-street parking, an outdoor patio, WiFi, and morning coffee and hot drinks. Please note that all of our rooms have private baths and air conditioning. 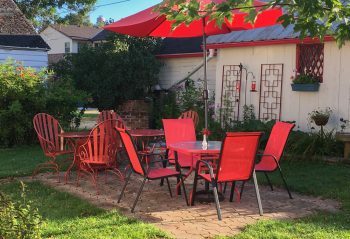 Located just a 10-minute walk from downtown Lanesboro, our setting is gardeny and peaceful, allowing you to get away from the hustle and bustle and relax and unwind. We are kitty-corner from the gas station and a home-style breakfast joint, The Cracked Egg. New 7/16: Our rare and unique Nordic Rose Garden. Now accepting credit cards – chip, swipe, and tap, for all cards. New raised beds, with more vegetables. Nisse fairy garden, and expanded Nisse Hunt. Guests receive a $5.00 discount off of each regularly priced adult ticket at the Commonweal Theatre. Family-friendly Norwegian scavenger hunt. Find the nisse hidden in the Guest Hus gardens and win a prize. Click for more details. New 9/17: Meet our newly adopted Australian zebra finches, Frigg and Frey. We look forward to hosting you in one of our five popular guest rooms or two vintage cabins! 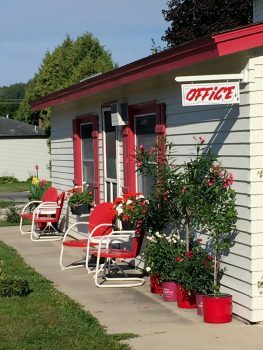 Learn more about the Guest Hus Motel rooms, the Historic Knotty Pine Cabins, or read reviews from our guests.